Haybar Properties LLC and Arkansas Community Colleges, led by Steve Cole, recently exchanged office buildings in two separate transactions. 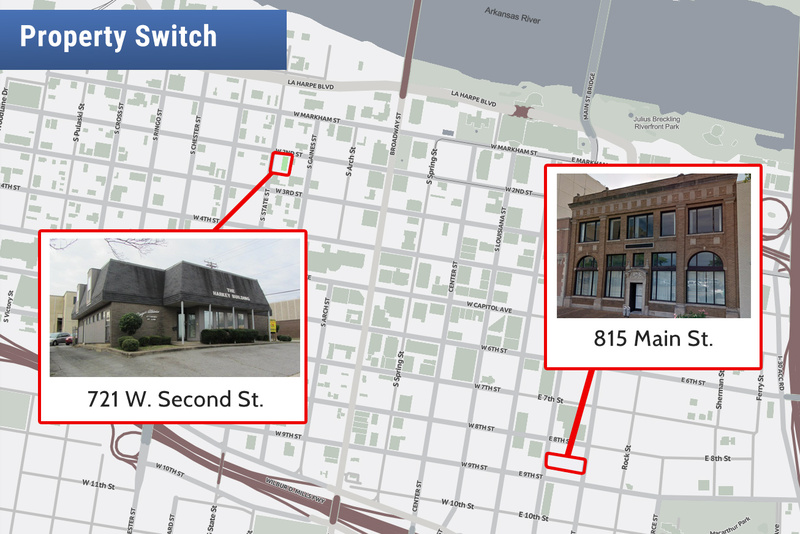 Arkansas Community Colleges sold a 14,000-SF office building at 815 Main St. in Little Rock for $715,000 to Haybar Properties. Haybar Properties LLC sold a 4,754-SF office building at 721 W. Second St. in Little Rock to Arkansas Community Colleges for $375,000. #40 Real Estate Partnership LLC, an affiliate of Ameripipe Supply of Dallas, bought a 37,743-SF office/warehouse at 400 Phillips Road in North Little Rock for $862,500. The seller was Consolidated Pipe & Supply Co. of Birmingham, Alabama. Liquor Exchange Inc. of Morrilton, led by Mary Ann Young, sold a 3,008-SF liquor store at 5820 Baseline Road in Little Rock for $300,000 to Ekroop LLC of North Little Rock, led by Gurpreet Kaur. Comfort Systems USA (Arkansas) Inc., led by Clyde Jester, bought about four acres adjoining its 3900 Terra Glen Lane facility there, between Sherwood and Jacksonville, for $300,000. The seller was Terraforma LLC of Maumelle, led by David Bruning and Doug Meyer. Arkansas Mold and Water Inc. of Little Rock, led by Kenneth Mullen, bought a 5,402-SF office/warehouse at 914 N. Olive St. in North Little Rock for $165,000. The seller was McRae Mortgage & Investment LLC of Little Rock, led by Kenneth McRae.